Warning (added on 1st June 2013): This post is deprecated as website hudeemail.com and its pushmail service has stopped working for past several years. First a clarification: shangmail.com is the Chinese website and hudeemail.com is the English website. Both seem to be related. Hudeemail provides a third party solution or alternative to official Blackberry pushmail. Hudeemail is free and is supported by Advertisements displayed over the emails. Most Ads are irritating. That is the mental price we have to pay. 1. Blackberry phone with TCP-IP through APN or wifi. 1. Hudeemail installation from here. Choose your version and download it on phone directly or through computer. The package is in zip format. It contains three files with same name i.e. HudeeMail but each with different extension. Unzip all the files on computer or on phone. For phone we may have to install Unzip or some app. Now press menu key on BB and choose ‘register’. Enter a user name before ‘Account’. A unique password for ‘Password’ and repeat it in next confirmation box. Next option is about Network. Leave it to default DirectTCP. Press Confirm and it should be done. If there is any problem try changing the user/account name. Once registration is done; login with newly created account and password. Now add your mailbox of gmail or yahoo or aol etc. by choosing Bind Account from the menu. Add two or more or all or as many. But all mailboxes will be linked to the default BB mailbox. Once done the pushmail will be delivered in BB mailbox. Please note that there is no HudeeMail mailbox. If perplexed read here. But please note that if we have BIS or BES connectivity, installing Hudeemail will disable the existing mailboxes. Then we can use only HudeeMail configured Mail Boxes only. Nothing short of un-installing HudeeMail, solves the Problem. It appears that after installation it works and after some time the Hudeemail stops syncing. It just does not deliver the messages. Actually some other programs also behave in this manner. There are three things we can do to solve this problem. First is to open Hudeemail and manually retrieve the email. One manual retrieval, generally solves the problem. Second is to exit the Hudeemail and restart the same. After re-start press options button and choose ‘Continue’ at top of the menu. Retrieve the mail manually once. This should solve the problem. Third is to pull the battery out to enforce hard restart. This also solves the problem. either of these methods or a combination can be successively employed to solve the problem. It is seven months, since I am using the Hudeemail. No problems so far, except this one, which is mostly solved by manual retrieval, once in a while. As per above settings after the power level drops to 20%, Hudeemail will go offline. In that case it has to be brought online manually. Once offline, it remains stuck there until it is brought online from the menu. The above instructions are indicative of how I installed Hudeemail on my Blackberry 9220 with OS 7.01. It may not work or may create trouble. I take no responsibility and personally I do not recommend installing HudeeMail or any application. For that matter I do not recommend any one to do anything at all; even to hold breath or to continue with breathing. It is interesting to know that while the above installation works on one phone but does not work on an identical phone. It may have something to do with service books as stated in the comments. There is another way to get these configuration files. Uninstall Hudeemail and subscribe to BIS for smallest cycle like a weak or a month and discontinue. Now reinstall Hudeemail. It may work. It is worth trying. Please help others by sharing in comments, if this method works. Handling Security issues with Hudeemail. This entry was posted in BlackBerry and tagged BIS, BlackBerry, BlackBerry App World, BlackBerry Internet Service, email without BIS, HudeeMail, Push e-mail, Pushmail, ShangMail. Bookmark the permalink. Hi Sandeepji, I wanted to inquire if Hudeemail services are currently working??? I managed to download Hudeemail on Blackberry 9100. Sorry. No. I have already mentioned it on the top. I’m still using logicmail on my 9500 Storm. Problem is, that it takes years for sending or recieving messages and at least 20 sec. to display an email. Do not try. So far it is end of good times. 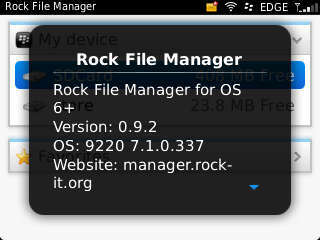 Please Reply and send it ASAP, becuase my Rock File Manager’s Trial version is going to end in 5 days. Not only the website but mail service provided by hudeemail is also down. It has stopped working for two days. There is no point in installation when it is not going to work. Use logicmail. Check logicmail dot com. Replace dot with (.). the HudeeMail on my BB9900 worked fine for abou 1,5 years. Since about three weeks, HudeeMail is completly offline. The HudeeMail website (http://www.hudeemail.com) is also offline. Was the service shut down? It appears that service is down. Now we can only wait. Shall revert if I find any news. Dear Sir, i install succesfully shangmail on my BB 9700 and 9790 The only problem i have is if i want to bind more account it wont work. Is there another way to do this. How many accounts have you bind with hudeemail? Due to security apprehensions I had bind only two. Both worked fine. Who is the ISP? Hotmail perhaps does not work. Yahoo and Gmail both work. Log into your account from desktop and check settings. See that imap is enabled. Alright, ill keep checking this blog, it was pretty usefull so far. Maybe in the near future there’l be some new apps i could use for my bb 9900. Hotmail only uses pop3 as far as i could find. Ive tried logicmail, alot of bugs and connection problems. the program is to plain. Is there anything else besides these two sandeep ? Sorry Tony, presently there is nothing else. But I have used logicmail as well. It was working fine. Infact more reliable than hudeemail. BTW have you checked the hotmail settiings if imap/pop mail is enabled? Gmail is not an option though, but i appreciate your fast reply. What is the next best thing that i could use for mail push ? any other 3th party program that allows me do have mail push besides hudeemail ? Use logicmail. That uses IMAP. With frequency set to 15 minutes or even less, it is as good as pushmail. Im not using an Gmail account. I use this Hotmail (live) account wich i want to add to my emailaccount on my BB. my BB ; an email icon with a globe in it. So for so good. but when i click on configure Email accounts it straightly goes to BES acctivation. What info do you need to help me with my issue, i really need the mail push. I suggest that you make a gmail account and try to bind it. If it works then the problem is with hotmail. i have installed everything as told, i have an BB 9900. How can i fix this ??????????? 1. Have you tried any gmail account? 2. What is the OS version on your BB9900? Sir, I have recently installed Hudeemail on my BB Curve 8520. After logging in successfully I added my gmail account. However every time I manually retrieve my mails it pops up ‘There are 0 new mails’. Moreover push mail is also not working and my BB maibox still asks me to activate BES. Kindly help. Personally I have no experience of earlier models but please read comments above. There are instructions to instal service book; that may help. BTW, have you used bid on this phone ever? The Yahoo thingy isnt working at all. Tried with method you said, tried with different yahoo accounts, nothing. So what i did was created a new gmail account, paired it up with my yahoo account so that recieve all my mails in gmail and then binded it with hudeemail and it works! Thanks! Now the next problem i face is the Hudeemail now says the trial version has expired. Please purchase this app! Any help with that? Crack or somethng? It is surprising. Please check the splash screen. Does it mention free. Compare with the two screen shots given above. It is surprising for two reasons. One because mine is working. Two it is supported by advertising. Right in the middle of composer/editor, there is a small ad strip, not to mention such clippings in reading the mail. Remove and download fresh files. If that does not work let me know. I will think of something. Now the thing is, even when it shows the trial version has expired, i am still getting mails in my mailbox! If it works like that, i am fine with it, but wont be add any account in the future. And yes, it shows free on the splash screen along with ad strips. There is an old saying that ‘don’t fix until broke’. If there is no problem don’t bother. Probably some bug which will be taken care in future edition. I think the yahoo problem is similar. I have just now created a new account from phone browser and bind it to BB with hudeemail. There was no problem. It is working fine. Try logging yahoo mail from browser and connect again with hudeemail while you remained logged in! Otherwise try yahoo help. Pl. Do let us know how you solved it. All the best. Successfully installed the app and created an account. 1. If i put up my gmail id and password, it shows- “Email Binding falied. Please check your email account configuration and make sure POP is activated. As regards, gmail, the problem appears to be that gmail prevents the login frm Hudeemail. Please check gmail help ‘unable to connect through POP or IMAP’ and follow the instructions. I had same problem. About Yahoo, I am not sure. May be similar to gmail. I shall revert about that ASAP. I was able to setup gmail. Gmail was preventing it to setup and with some tweaks I was able to do that. Thanks! Now still, the Yahoo problem persists. It shows the same thing. And the I really want Yahoo to be setup as it is my primary id and I use it daily whereas I use gmail rarely. Really hoping for a solution for this. How long did the service last? Few sessions or days or months? VIP is the Enterprise Solution or hack. I do not know for sure. But the splash says that it is free. Earlier opening splash did not mention anything. The VIP version suggestion is just a splash. No it is not anymore. I just tried to install it on my BB Curve 9360. It worked for some mails. Then it was expired and I would have to pay for the service. hey..i use os6..but its says error in cod file when i try installing it..what should i do !!! Please download the file for OS version 6. Sir please tell me after installing hudeemail successfully on blackberry curve 8520 i tried to send email through BB its showing “no message services configured. You will only able to save draft” what to do? please sir tell me in detail….Thanks…. Mozam, please add your mail box to hudee. It is merely a carrier. You have to add your gmail or yahoo or whatever your mailbox is, to it. We need to enter the email address and passward by adding account within hudeemail. But please go through the security precautions (as suggested in https://sandeepbhalla.com/2012/09/09/how-to-handle-security-issues-with-shangmailhudeemail/) as well. If there is any problem, I am here. Dear mozam, only installing the hudeemail, you can’t send email through hudeemail. A SERVICE BOOK is required to send the email through hudeemail. This simple hack enables Blackberry default browser & hudeemail to use a normal internet plan instead of a costly data plan. plese visit: http://manishbhat2749.blogspot.in/2012/08/enable-blackberry-push-mail-and-browser.html. Try it your own risk. I had successfully completed in my bb 8310. I still maintain that nothing else need to be done in respect of BB9220. I did not download any service book. After installing, create/bind accounts, refresh from within hudeemail, once and it should work. If at any time it appears to be struck, start hudeemail and refresh again. That’s all. I am still not sure why service book is required or is it required in earlier versions only? Yes, you surely can use TCP. It is the official position of BlackBerry that APN settings are meant for using browser. BB mail and BBM will not function without BIS.But we need to pay normal TCP-IP browsing charges to the provider. Sir,i think a servicebook must required for sending mail from BB without BES/BIS.for more information:https://sites.google.com/a/anworm.com/bbwobis/Home/free–try–blackberry-push-mail-with-shangmail.Thank you sir.. Thank you for sharing. I am not sure if that information pertains to OS 5.0 or supports OS 7.01. But I had no such problem. By clickiing reply I could send messages. It should be working. BTW did you create a new mailbox (as suggested in https://sandeepbhalla.com/2012/09/09/how-to-handle-security-issues-with-shangmailhudeemail/) or using the old one. I think you got it slightly wrong. Did you Open Hudeemail or clicked on mailbox. How you started to compose new mail? (amazonaws.com) Location: Harrison, NY, USA”. What happend? is it normal? Dear sir,thats worked!now i can receive email in my BB.then i tried to send email through BB its showing “no message services configured. You will only able to save draft” what to do?